Before I ever became obsessed with beer and computers, I gave serious thought to studying aeronautical engineering. 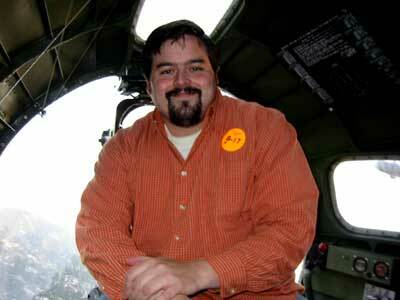 I was always the kid who could rattle off a bunch of facts and figures about various aircraft. As time went by and computers took their place as my first study, but history always was close behind. Back in 2003, my co-worker and crazy friend, Bill McAdams and I tripped across an internet listing that announced the "Wings of Freedom" Tour's imminent arrival at the Burbank Airport. The tour consists of a pair of working WWII vintage bombers, a B-17 and a B-24, owned and maintained by the Collings Foundation of Stow, MA. These are some of the last flight worthy WWII bombers operating today. Needless to say the history and machinery geeks in Bill and I perked right up at the thought of being able to touch and smell, a genuine piece of American history. Even better, for a small and reasonable donation Bill and I could take a 30 minute flight over Los Angeles! Being two reasonably employed engineers with no families requiring our support, we jumped on board by calling and holding a spot on the beautiful B-17. This was my birthday gift to myself and Bill's rite of spring. The flights are amazingly quick. As you'll see in the photos below, everyone (~11 max) straps into seating positions on the floor and the Bombers taxi and with a roar of four turbo charged prop engines, the bomber grabs the sky. Once the wheels are off, everyone is free to leave their seats and wander the length of the plane. 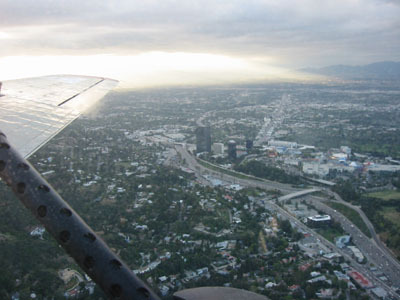 The flight circles down across the Hollywood Hills and out to the ocean before swinging back over Topanga Canyon and across the Valley to the Burbank Airport. During the flight the canopy roof of the navigator station is left off. Standing up to full height, you can stand with your head above the roof in the slipstream. It's definately the ultimate convertible! 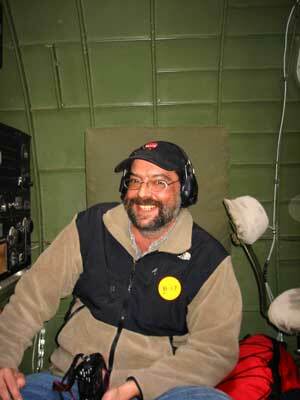 In 2003 and 2004, Bill and I ponied up the funds and grabbed a seat on the plane. Both times we remained giddy and giggled like children for a week following our flight A month after our 2004 flight, Bill passed away at the age of 38. 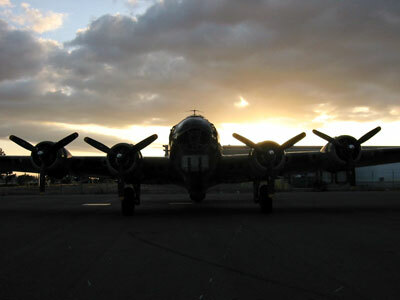 After talking to the Collings Foundation, I'm glad to say that Bill will get to fly the season on the B-17 as his name will be adorning the bomb bay doors. Frankly, I think Bill will be annoyed that they don't get to drop any bombs out of it anymore. Hope you enjoy the pictures. Take a look and reflect on the sacrifices of the bomber crews in WWII. Pay attention to the Collings Foundation website for dates of their tours. It's a worthwhile experience. This is the sight that awaits you at the airport when you arrive to take your flight. 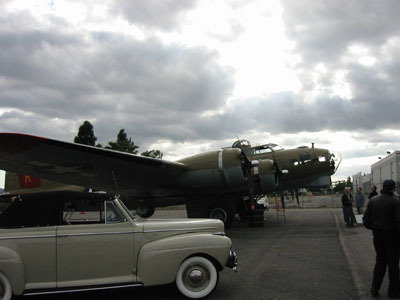 It's a slice of 1944 with the ragtop Mercury parked on the tarmac next to the B-17 painted as the "Nine O Nine". 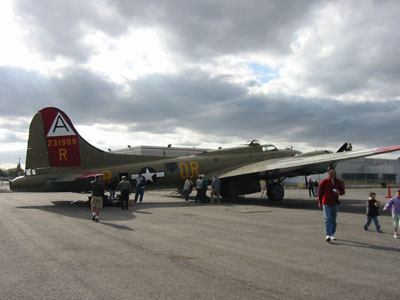 The B-17 is a classic beauty with a long line and a graceful form. Not too surprisingly though, there isn't much height in one of these planes, so you have to watch your head as you're wandering through. It's not too hard to ram your head into the roof if the plane's running into a bit of a disturbance. Fortunately for us, the flights over LA are calm and free of German flak. 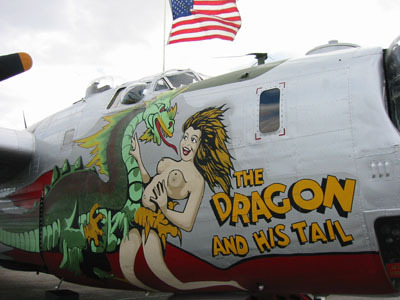 The "Nine O Nine"'s sister plane, the B-24 painted as "The Dragon and His Tail". 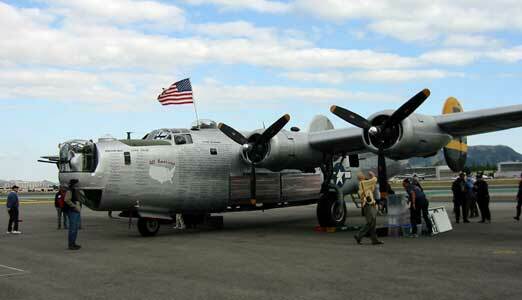 In 2005, the B-24 is being repainted as the "Witchcraft". To get a sense of the size of the B-24, that's Bill standing next to the nose of the plane. Bill was about 6'2". Although everyone thinks of the B-17 when you mention WWII bombers, the B-24 was more numerous, carried more bombers and had a longer range. Even for Bill and I, the hard cold facts can't compensate for the ugly duckling stature of the bomber, compared to the B-17. No matter how innocent and prim we think our fathers and grandfathers were, one look at this plane's nose art should dispell some of that myth. This particular art is from a particularly famous plane that served in the Pacific Theater. On our first trip, Bill and I grabbed some cushions in the navigator's room. You can see the vintage radio equipment to Bill's right. Since we ended up next to the engines, we decided a little noise protection would be prudent. Oh, and that big cheesy grin on Bill's face? Mirrored on my face. Stayed there for a whole week. Here we're looking back towards the plane's tail. The funny silver sphere that's a pain to step up around is the ball gunner's turret. The Collings' folks smartly don't allow anyone in there. Of course, my big toe would barely fit in the turret, let alone my whole giant self. An important part of this trip (2003) was the 70+ year old gentleman you see seated to the left of turret next to the waist guns. He was flying with his family to show them a bit of his history. More importantly, this was his first flight in a B-17 since 1944 when he and his crew were shot down on a mission over Germany. We thanked him for his service and quickly left him with family. Frankly, if I'd been shot down you'd have a hard time getting me onto any plane, let alone the same plane that came out from underneath me! Remember Bill's stupid grin? Well here's mine. 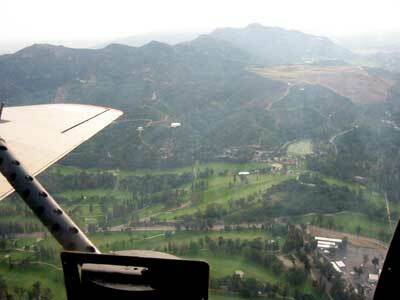 This was taken up in the bombardier's nose as we flew over the Sepulveda pass. My hair's a little mussed from the breeze looking out over the plane. 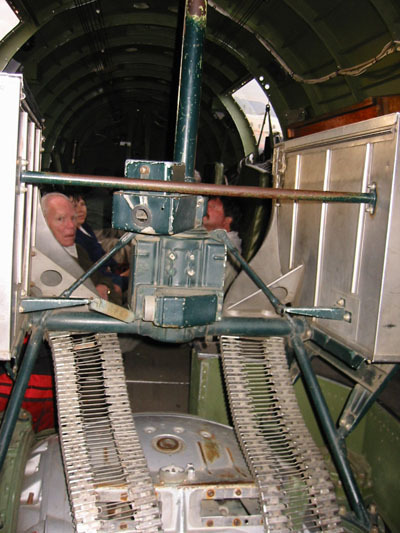 When you sit in the bombardier's chair and look out through the Norton bombsight, all images of support drop away and you feel like you're floating in a giant glass bubble. This was our approximate flight path in 2004 as we flew south out of Burbank, looped back over the airport for a low altitude flyby. 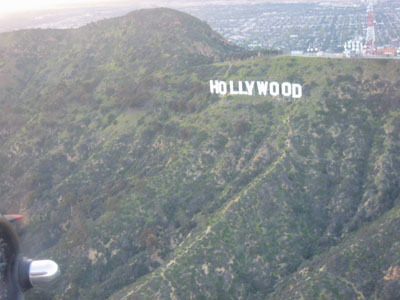 From there we preceded down around the spur of Griffith Park before continuing along the spine of the Hollywood Hills. 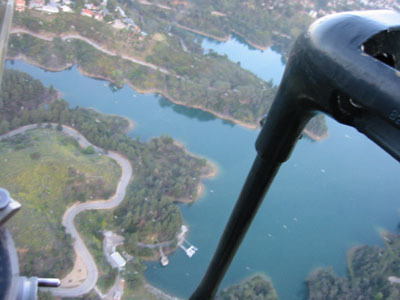 We continued swinging out towards the ocean over the Palisades before swooping back up through Topanga Canyon over Woodland Hills and the Van Nuys airport and back down at Burbank. Funny thing is that LA looks green and lovely from the sky. A few images of the trip. When you touch down, there is a moment of joy at safely returning from an adventure, but it's mixed with a heavy dose of sadness that for another year, you're down on the ground. Our first flight (2003) took off at the last possible moment and returned to the airport just as the sun rapidly approached the horizon. As we walked away from this little adventure, a big smile plastered on our mugs and a leap in our hearts, I stopped and grabbed one last view of our bird. Well that's our adventure with the Collings Foundation Bombers. Please give them a chance. Visit a working piece of history. You won't be disappointed.